Honestly I'm only a very recent coffee drinker. My go-to drink in college was always Mountain Dew or Dr. Pepper. As I got older and tried to lose weight I switched over to diet mountain dew or diet dr. pepper. Part of the reason for this is that neither of my parents are coffee drinkers. Honestly I never new how to even make a pot of coffee until say I was in my thirties. I personally always like the flavor of coffee flavored food/beverages but never drank "regular coffee". The closest thing I would have to coffee would be a pumpkin spice frozen coffee drink or other similar drinks. Eventually after a while my wife and I bought a k-cup machine and started down the k-cup path. However unlike most people I drank my k-cup's without cream or sugar. During the k-cup period I got "hooked" on Starbucks. Unlike most people my favorite Starbucks drinks were either tall/grande blonde roast or a grande vanilla latte made with non-fat. I still to this day will grab a latte, however my Starbucks habit is gone. The next part of my exploration which was about five years+ ago was going towards drip brew. Now I really didn't know anything about coffee and did the normal mainstream thing. Mr. Coffee machine using Folgers or Starbucks blonde roast(pre-ground) at home. Its during this period where I started to phase out of drinking diet soda and went towards drinking only plain coffee on a daily basis. Finally towards the end of the Mr. Coffee phase something happened. I had wanted a new coffee maker something better that what I had and then started to learn that there was a world beyond Starbucks and Mr. Coffee. A quick google lead me to sites like thewirecutter.com and the Speciality Coffee Association of america (SCAA). I quickly learned that drip coffee makers could be certified and buying whole bean coffee will taste better. This I admit changed my whole perspective on how I made, drink and bought coffee. I started to research what type of drip coffee make to use in the mornings. I ended up with a OXO on 9 cup coffee maker. I then purchased a real entry level grinder Barazta Encore. During this time, I learned that coffee should be stored airtight (I use a Friis container) and ground right before brewing. It took a while for me to transition from pre-ground to mass market whole bean, but I made that transition. During the transition to whole bean coffee I would buy coffee from local roasters. Those included Goshen, Kaldi, Park Avenue and Stringbean. This lead to the next transition where I no longer cared completely about the cost but rather the flavor profile of what I drink. If cost was an issue I would still buy mass market Starbucks whole bean coffee which is at least 25% cheaper than what I currently buy. After about 18 months, I have ended with what I call my daily grind routine for coffee. My equipment setup still consists of the Oxo on 9 cup and the Barazta Encore. Everyday I wake up grind about 49 grams of coffee which is brewed against 887 ml of water(30 oz) as recommended by the maker of the coffee machine. My primary roast that I drink is Stringbean Ethiopian True Blue. It's a light roast that's just awesome. More recently I have ventured into brewing methods beyond the drip. I currently have experimented with cold brew, french press and pour over. 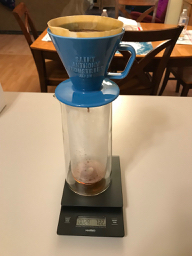 My current pour-over setup uses a Phoenix70 or C70 Ceramic depending on my mood. Perhaps in another coffee discussion we can talk more about these and some other interesting coffee adventures.